Athleticism, strength and performance are the main inspirations for H&M Sport this Spring 2015, with pieces that work for the body no matter the level of skill. Functionality and technical details not only add an advantage, they also look great too. Pushing fitness to the maximum with functional and stylish pieces for your best ever sporting season. Layering is the key as the weather warms up, with technical fabrics and functional details to help with performance whatever the sport of choice. Meanwhile H&M Sport for kids combines fashion and function with a feeling of fun. It’s all part of the newly expanded H&M Sport range, with the spring 2015 collection available from January 2, 2015 in selected H&M stores worldwide, as well as online. For women - seamless running tops and running tights have engineered construction for articulation and comfort. Technical zip-ups provide protection from the elements, with reflective trims for safety and a small running rucksack that fits firmly into the back. For men - windproof zip-up jackets and tights protect from the weather, with technical T-shirts and shorts for when it warms up, or windproof vests for if sudden protection and warmth is needed. All in shades of black and grey with neon yellow and neon orange contrasts. For women - sports bras and vests come in vivid colours for women, perfect to mix and match with leggings in a variety of prints or block shades. Mesh is a key detail, especially on a raglan sleeve zip-up jacket, or as a panel for extra breathability on the back of a sports bra. For men - technical work-out T-shirts are printed with slogans, with long-sleeve Ts as well as running tights for layering warmth, perfect to wear under more relaxed shorts. For women - there are functional layers for every situation for women, from sports bras and vests through to warming middle layers, and outerlayers that combine fleece with mesh for both protection and breathability. For men - wind and waterproof zip-up jackets combine different textures of fleece and give protection where it’s needed. 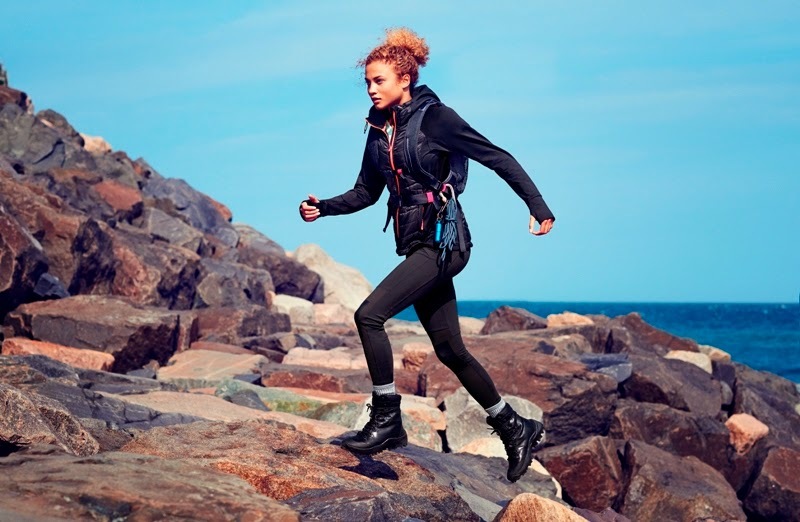 Outdoor pants in hardwearing fabric have large utility pockets, while a body-contoured base layer is quick drying to help the body keep moisture away. For women – body/mind activities, there’s a softer feel to the melange vests and leggings in grey, black or white, with pops of pink and mint. For girls - mesh tanks printed with athletic numbers, warming vests and workout tights, alongside dance and ballet pieces for younger girls. For boys - American athletic prints in vivid colours are on T-shirts, tanks and hoodies, with beanies and padded jackets for when the weather is still cold, alongside a zip-up jacket.